As many collisions occur when bikers share the roads and perform “lane splitting” Arrive Alive approached Motorbike expert Hein Jonker and asked his advice on when to do this, how to do it and when rather to avoid it! Lane splitting in a safe and prudent manner is not illegal in South Africa. Here are some lane-splitting tips for motorcyclists, and to help motorists understand why we do it. The term lane-splitting, sometimes known as lane sharing, filtering or white-lining, refers to the process of a motorcyclist riding between lanes of stopped or slower moving traffic or moving between lanes to the front of traffic stopped at a traffic light. Speaking to Johan Jonck from Arrive Alive on how thoughtful and considerate motorists are toward motorbike riders, he said: "Traffic congestion adds to the frustrations experienced by motorists. It may be frustrating when you see motorcyclists pass by while you remain stuck in traffic, but when performed correctly there should not be a reason for any increased animosity. "Most motorists understand this, but there will always be the few who do not consider this with the necessary thoughtfulness and by being respectful to the safety of the motorcyclist." Jonck says: "The best is to remain respectful to fellow road users and consider that this might not have been intentionally," when posed with the question what riders should do when a motorist denies them lane-splitting. "Give the motorists the benefit of the doubt and be ready to slow down and then make a normal passing manoeuvre when the opportunity presents itself." Importantly, Jonck mentions that motorists are under no obligation to allow lane splitting, even if it is legal. He says: "There is no legal obligation on the motorists apart from staying in his lane and indicating when moving to another lane. We (motorists) may, however, not make any reckless moves or endanger the lives of others on the roads. Intentionally blocking or hindering a motorcyclist in a way that could cause harm to the rider is illegal." • Travel at a speed that is no more than 20km/h faster than other traffic - danger increases at higher speed differentials. • A speed differential of 20km/h or less allows an alert, competent rider enough time to identify and react to most dangerous situations that can occur. • The greater the speed differential, the less time a rider has to identify and react to a hazard. • It is not advisable to lane split when traffic flow is at 50km/h or faster - danger increases as overall speed increases. • At just 30km/h, in the 1 or 2 seconds it takes a rider to identify a hazard, that rider will travel approximately 10 to 20m before even starting to take evasive action. Actual reaction (braking or swerving), will take additional time and distance. • Braking and stopping distance varies greatly based on a multitude of factors (rider, machine and environment). • As speed increases, crash severity increases. • Typically, it is safer to split between the No. 1 and No. 2 lanes than between other lanes. • Other road users are more accustomed to motorcycles splitting between the outside and middle lanes. • Avoid splitting in lanes near freeway on-ramps and exits. 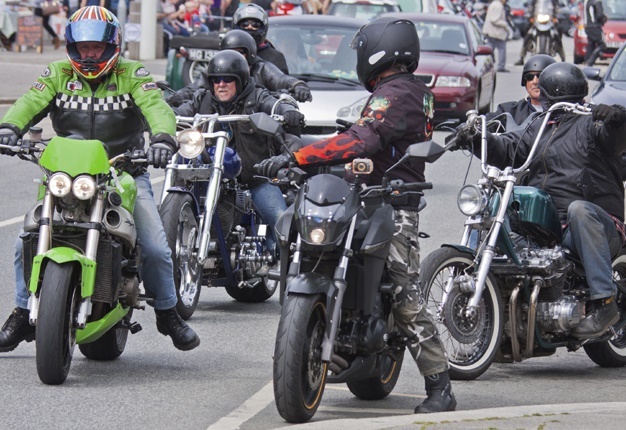 • Avoid splitting lanes when another motorcycle rider is splitting between other nearby lanes as cars may make additional room for one rider and accidentally reduce space for another. • Consider the total environment in which you are splitting, including the width of the lanes, size of surrounding vehicles, as well as roadway, weather, and lighting conditions. • Some lanes are narrower than others, leaving little room to pass safely. If you can't fit, don't split. • Some vehicles are wider than others - it is not advisable to split near wide trucks. • Know the limitations of your motorcycle - wide bars, fairing and bags require more space between vehicles. • Avoid splitting on unfamiliar roads to avoid surprises such as poor road surfaces. • Seams in the asphalt or concrete between lanes can be dangerous if they are wide or uneven. • Poor visibility, due to darkness or weather conditions, makes it difficult for riders to see road hazards and makes it more difficult for drivers to see you. • Help drivers see you by wearing brightly coloured protective gear and using high beams during daylight. • Be alert and anticipate possible movements by other road users. • Be very aware of what the cars around you are doing. If a space, or gap, opens up next to your lane, be prepared react accordingly. • Always be prepared to take evasive action if a vehicle changes lanes. • Account for inattentive or distracted drivers. • Riders should not weave back and forth between lanes or ride on top of the line. • Riders should avoid lingering in blind spots. • Never ride while impaired by drugs, alcohol or fatigue. • Constantly scan for changing conditions. Arrive Alive says: Be Reasonable, be Responsible, be Respectful, be aware of all Roadway and traffic conditions. 1 Reasonable means not more than 20km/h faster than traffic flow and not over 60km/h. 2 You are Responsible for your own safety and decisions. • Don't put yourself in dangerous positions. • If you can't fit, don't split. 3 Be Respectful - sharing the road goes both ways. • Don't rely on loud pipes to keep you safe, loud pipes often startle people and poison the attitude of car drivers toward motorcyclists. • Other vehicles are not required to make space for motorcycles to lane split. 4 Roadways and traffic can be hazardous. • These general guidelines are not guaranteed to keep you safe, says Arrive Alive. • Lane splitting should not be performed by inexperienced riders. These guidelines assume a high level of riding competency and experience. • The recommendations contained here are only general guidelines and cannot cover all possible combinations of situations and variables. • Personal Safety: Every rider has ultimate responsibility for his or her own decision making and safety. • Riders must be conscious of reducing accident risk at all times. South African law requires all motorcycle riders and passengers wear a helmet that complies with the DOT FMVSS 218 standard. • If you can't fit. • At a toll booth. • If traffic is moving too fast or unpredictably. • If dangerous road conditions exist - examples include water or grit on the road, slippery road markings, road construction, uneven road surface, metal grids, etc. • If you cannot clearly see a way out of the space you're going into (for example, if a van or SUV is blocking your view). • Between trucks, buses, vehicle pulling trailers or caravans, and other wide vehicles. • Around or through curves. • If you are not fully alert and aware of your surroundings. • If you are unable to immediately react to changing conditions. • If you don't feel comfortable with the situation. 1 Lane splitting by motorcycles is not illegal in South Africa when done in a safe and sensible manner and as long as the National Road Traffic Act & Regulations 93 of 1996 are adhered to. 2 Motorists should not take it upon themselves to discourage motorcyclists from lane splitting. 3 Intentionally blocking or hindering a motorcyclist in a way that could cause harm to the rider is illegal. 4 Opening a vehicle door to obstruct a motorcycle is illegal. 5 Never drive while distracted. - Allowing more following distance, three or four seconds, when behind a motorcycle so the motorcyclist has enough time to manoeuvre or stop in an emergency. All excellent advice except for one observation - if you lane split at 20 km/hr you are barely out of 1st gear and you are going to have a procession of impatient and angry bikers up your a$$ in no time - and my experience is that bikers in a hurry coming from behind are much more dangerous that cars that I am concentrating on in front! I find that around 40 km/hr works for me and allows me to focus on the cars ahead and react in time if I see anyone about to do anything stupid. "Travel at a speed that is no more than 20km/h faster than other traffic"
The difference between 30km/hr vs 40km/hr is that in the first you will be able to stop in time, and the other will kill you. It is that close. Impact energy increases as the square of your speed. I agree that 20km/hr is a bit slow between stationary traffic, but more than 30 is too fast. I have no problem with bikes coming up behind me - at the first safe opportunity I move over so they can pass and they always thank me. All very valid comments in this article, thanks for sharing! I follow a quite simple rule and so far it worked very well for me. To date I had very few scares and no close encounters with cars. I filter between cars only if they are stationary. As soon as they start moving (typically 20-30km/h) I change to car mode. Then I ride in the flow and pass like I would do in a car. Another advantage of riding this way is that any car driver has more time to become aware of your presence. One may think this way of driving/riding slows you down....yes, maybe little bit, but the lowered risk of an incident outweighs the bit of time you would gain by charging through at speed. Being very awake and keeping up your concentration is very very important! Note: By the way, why is the picture of the Ducati in the article a mirror image? Changing a right-side drive picture to a left-side drive picture? My biggest scare was when I was not lane-splitting. I was in the lane like a car, when the car in front of me stopped suddenly. I hit the brakes and had to control the bike's fishtailing while desperately wishing I had been lane-splitting rather than in the traffic. I was aiming for the gap between the lanes, convinced I was going to hit the left rear bumper of the car (because Mr.Badger was almost sideways at this point). At the last, as I was about to hit the car, I release the back brake, and the back straightened out and there was no bump so I knew I missed the car. It must have been close, because I was convinced I hit that car. Lesson for me: don't ride a motorbike like a car. Rather lane-split. It's worked this far. Charles said: Lesson for me: don't ride a motorbike like a car. Rather lane-split. It's worked this far. Yes, scary when a car suddenly stops ahead of you. For this reason I ride close to the white line, but not between a moving car and the white line (which I define as lane splitting). Filtering to me is when you actually pass between two cars that are either side of the white line, whether they are moving or stationary. Basically one always need to try and keep some escape route available. A good following distance is one way, riding to one side behind a car is another. Agree with you Danie. If there is a gap in the lane next to a car, do not lane split past that car for fear he will take the gap. Unfortunately, I see many bikes riding on the left or right bumper of a car. Apart from being rude, it is dangerous. There is not enough time to swerve if the car touches the brakes. Rather just ride in the gap, and, because you should avoid lurking in the blind spot, just pass the car slowly. Either that, or fall back to a safe following distance. Cars riding bumper to bumper can do that safely. If something goes wrong it will be a non-life-threatening fender-bender. On a bike however, the odds are not good for your health.